Brody Buhler, global managing director, post and parcel industry group, Accenture, talks to PPTI about the company’s latest research and the impact AI will have on the postal sector. Ahead of his presentation at POST-EXPO 2017, Holger Winklbauer, CEO at International Post Corporation (IPC), talks to PPTI about the latest changes in e-commerce markets. Interest in physical trackers for monitoring parcels is at a high as customers demand more accurate and reliable information about their deliveries. 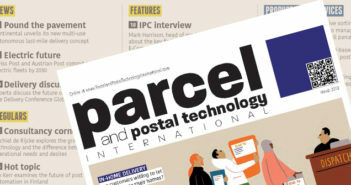 Kirstie Pickering looks at the progress of parcel tracking devices. Prime vision explores the application of artificial intelligence and machine learning in the postal, parcel and logistics industry. This week Omniva selected Fives to install the sorting system for its new Tallinn hub (story here). Joona Saluveer, the recently appointed chairperson to the Omniva board, speaks to PPTI about the company’s future strategy and the challenges of digitization. Delegates from the logistics and delivery sector will gather in Arlington, Virginia, on March 21-22, 2017, for PostalVision 2020/7.0 – Business NOT As Usual. Ahead of the conference, John Callan, co-founder of the PostalVision 2020 initiative, explores the disruptive influences and innovators that have shaped the modern postal sector.